You add a good dose of this lovely little yellow fruit into your dal and curries and salads. It adds a burst of freshness and flavour into your food. But taste aside; there is another good reason for using lemons in your diet. That it is packed with nutrition. High in Vitamin C, flavonoids, magnesium and calcium and rich in antioxidants, lime juice is a welcome addition into your diet. How does lemon help you? Lemon juice is great for tonsillitis and other throat disorders. Gargle some warm water with lemon juice. 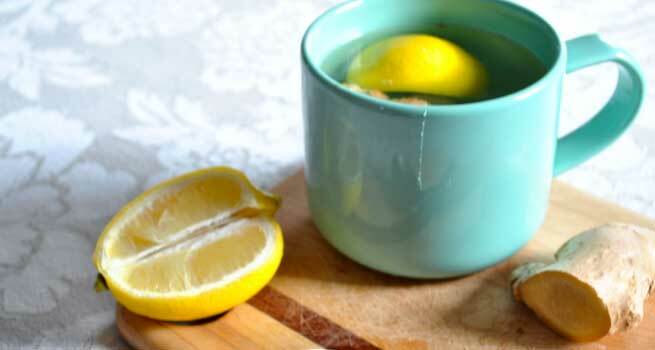 Drink warm water with some lemon juice squeezed and a spoonful of honey to relieve cold and throat irritation. Lemon juice in warm water is a good remedy for nausea and constipation. Drink a glassful of warm water with lemon squeezed into it early in the morning to treat any stomach disorders. Lemon juice has anti-cancer compounds. Limonine present in lemons is known to slow down the growth of tumours. Lemon is also a good anti-depressant. Drinking lemon juice makes you feel good! Lemon juice when applied on the skin is very good for treating pimples and acne. It also helps in lightening the skin and reducing pigmentation. It helps flush out toxins from the body. A glass of lemon water first thing in the morning is the best way to flush out toxins from the body. Lemon oil has very relaxing effect on the body. Use some lemon oil in your bath water to calm your mind and body. The vitamin C in lemon helps in reducing fever. If you feel like you are going to go down with fever, have a cup of warm water with lemon and honey. Drink this couple of times in a day to fend off fever before it peaks. Lemon helps in getting rid of tooth and gum issues. Simply apply some lemon juice on the teeth or gum where you have an ache and leave it on. Massaging your gums with lemon juice can reduce gum bleeding. Drinking lemon water often through the day helps in preventing bad breath. Adding a few drops of lemon juice to your toothpaste will help whiten your teeth too! Lemon juice applied on the scalp helps control oiliness of the scalp and also prevents dandruff. Rinsing the hair after shampoo with lemon water adds lustre to your hair. Drinking lemon water first thing in the morning helps in weight loss by method of flushing out toxins and improving metabolism. The potassium in lemon helps contain high blood pressure and other related heart disorders. If you have skin troubles like eczema, lemon juice is there for your rescue. Mix two parts of lemon juice with one part of honey on the affected area and leave it on to dry before washing it off. Regular use helps reduce irritation. Last but not the least, a glassful of chilled lemon juice, with sugar and salt is an instant energy booster and fights fatigue. On a hot summer day or after a long day at work, unwind with a glass of chilled lemonade and fight your blues away.